All Liberty Walk official products have certificate from Liberty Walk. Please make sure to check the serial number of the certificate and the model name of the product when you received the product. 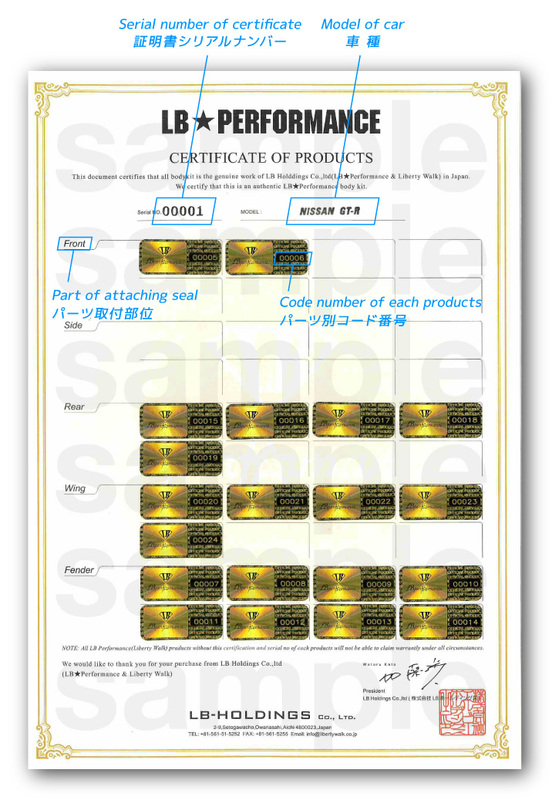 A hologram seal with a code number is attached on each products*2, and a hologram seal with same code number is attached on certificate too. Liberty Walk head office control all serial number of certificate and product code by computer system. Hologram seal attached on each product adopt advanced anti-counterfeiting system. If peel off the seal, the seal is broken. Hologram seal cannot be reissued. Please paint and install without peeling hologram seal. *It depends on size of products, there may be cases when hologram seal can’t be attached.